Winslow Homer, To the Rescue, 1886. Oil on canvas, 24 x 30 in. The Phillips Collection, Washington, D.C. Acquired 1926. We were relieved to hear, back in March, that the National Art Center, Tokyo, was standing strong in the wake of the massive earthquake and subsequent tsunami. 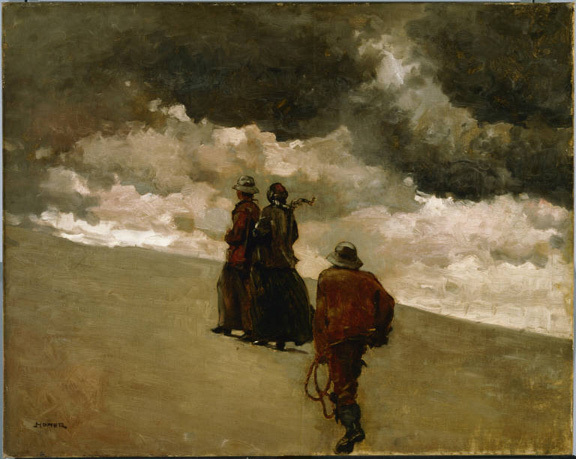 Not only was there the possibility that natural disaster could create a cultural disaster for the Center, we were also looking forward to this month when a significant selection of our American works will be on view as part of To See as Artists See: American Art from The Phillips Collection. The show opens September 28, and the art is currently being installed. No sooner did our chief registrar and two curators arrive to oversee the effort than a powerful storm, Typhoon Roke, made landfall. Thankfully, we’ve heard from our colleagues that the National Art Center is such a substantial structure that they were barely aware of the dramatic event unfolding outside of the museum walls and have been safe while traveling around the city. We all wish them luck, a successful opening, and a safe trip back to D.C.!